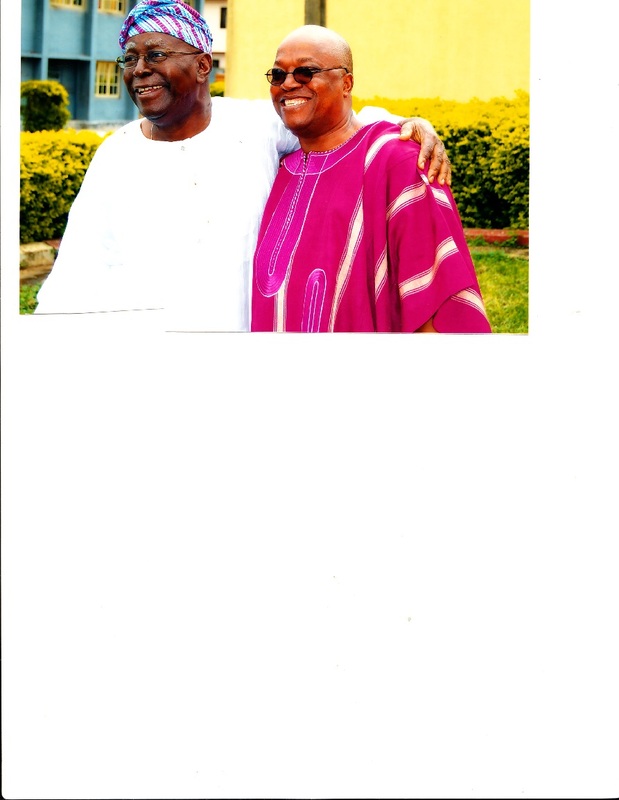 Mama Julie – the last of the first generation Adamolekuns: Papa J.F. 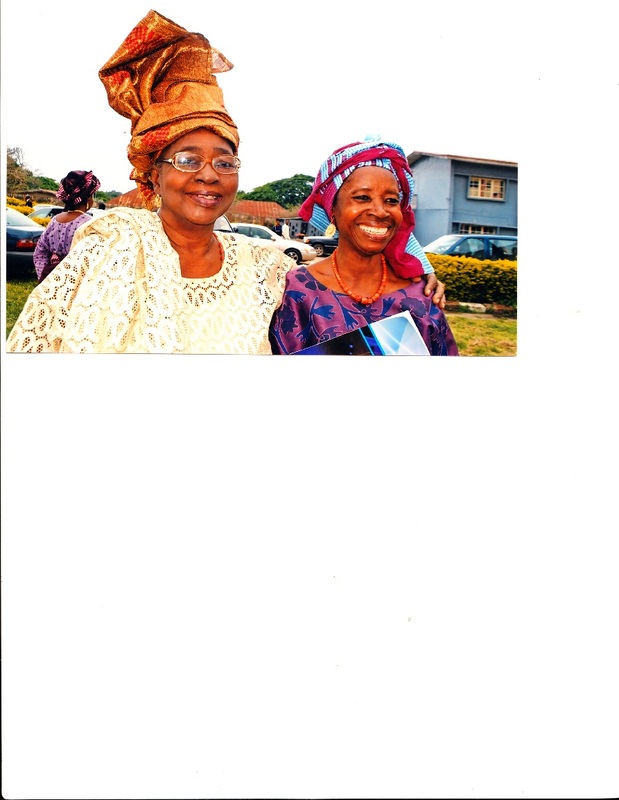 ; Mama Dorcas and Mama Comfort – passed away peacefully in the early hours of Tuesday, June 11, 2013, and was laid to rest at Iju on Saturday, August 3 at the Anglican Archdeaconry Church Cemetery. 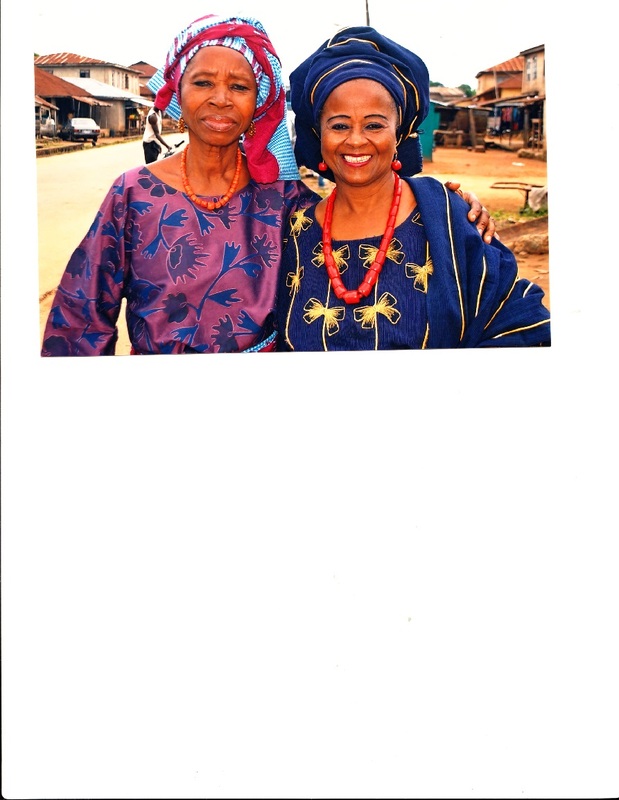 Born in 1921 to David Falade AFTER his death – hence the name Bamo, Dad did not get to know her – she is survived by all her four children: Professor Ladipo Adamolekun, whose 70th birthday celebrations she was part of a year ago, Olori Ronke Olugbemigun, a retired Manager with UTC Stores, Ibadan & Apapa, Mrs. Felicia Akindejoye, an Idi-Aba graduate and a caterer, & Dr. Wole Adamolekun, a civil servant with Nigeria’s central government; there are also ten grand-children and eight great-grandchildren among whom is a university undergraduate. 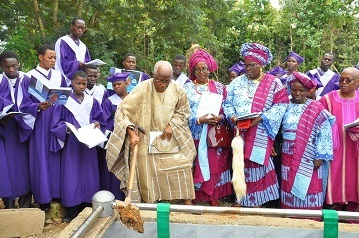 All living Adamolekun children were part of the celebrations: 87 year-old Barrister I.O. 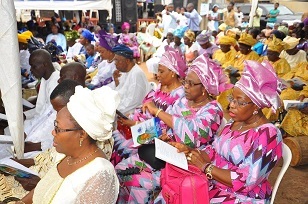 Adamolekun, Mrs. Abi Araromi, Mrs. Huldah Ogunmola, Dr. Joseph Adamolekun, Mrs. Dunni Fagbuyiro, Mrs. Ayo Adubifa, Rev. 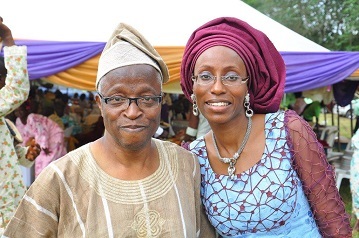 Joe Adamolekun (all septuagenarians), Ms. Taiwo Adamolekun and this blogger; so were most of the Adamolekun grandchildren, led by Engineer Oludotun Adamolekun; Waleola Ojomo; Rotimi Adamolekun, Sile Aluko, mother of (Eniola, attorney and England Women’s Soccer team member & Professor Aluko’s grandchild); Soji Ajakaiye, Kemi Fagbuyiro and many others. 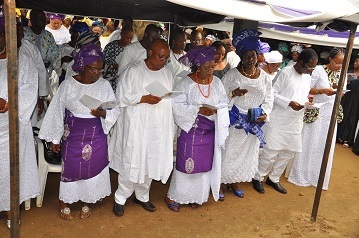 At the Christian Wake at the family home were clergymen, led by retired Archbishop for the Province of Ondo, Iju-born Dr. Samuel Adedayo Abe and his wife, Mama Janet Abe (friend and classmate of Ronke Olugbemigun). 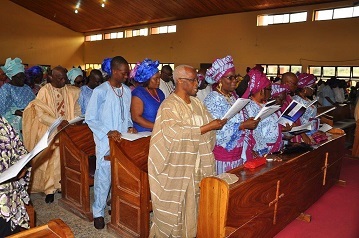 Archbishop Abe also preached the sermon at the Sunday fairwell ceremony at the St. Stephen’s Archdeaconry Church at which there were also retired Bishop Oyelade and all Iju Archdeaconry Anglican Priests which featured the church’s current choristers that continue Iju’s tradition of exemplary Choral Music that dates to the 1950s. 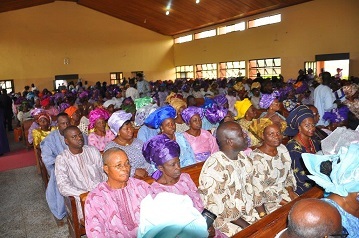 Archbishop Abe recalled the virtues of Mama who was Iyalode of the Church from 1974 to her death and the role that she played as a very active church member. 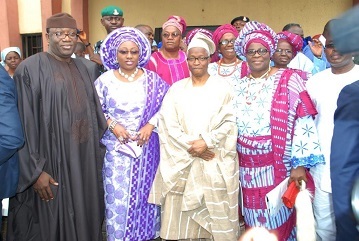 Also present at the church service were Governor of Ekiti, Dr. Kayode Fayemi and his wife, Erelu Bisi, many associates and friends of Mama’s children and top government functionaries (Wole’s guests), including Mr. Stanley, an Executive Secretary with Nigeria’s central government at Abuja. 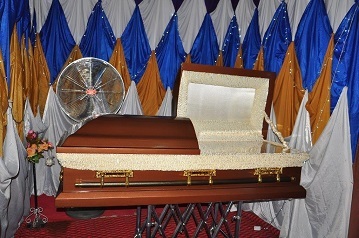 Ondo’s Governor, Dr. Olusegun Mimiko had earlier visited as he would not be able to attend the funeral. Mama will be mourned by his children, extended family, the various groups she belonged to at St. Stephen’s Church. Here are memories stored, and now shared from the 2-day event. 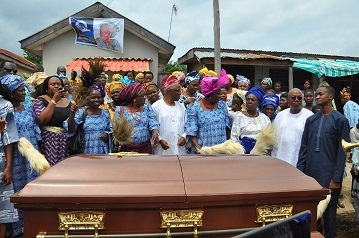 From Left: Bisi & Wole, Jumoke & Ladipo, Felicia and Ronke (front) leave Ladipo’s house after a brief stop with Mama’s remains. 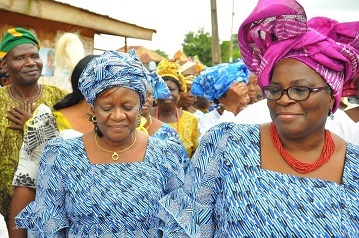 Behind Bisi is Soji Ajakaiye, an Adamolekun grandchild. 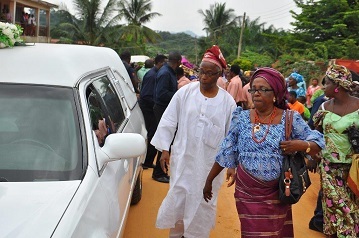 Ladipo and Ronke walk beside the hearse after a brief stop at Ladipo’s Iju home on way to Family home. 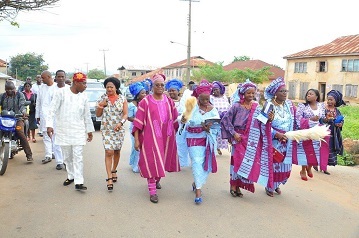 Blogger meets children leading Mama’s remains to the family house: (In sun glasses), Wole, Ladipo, Blogger, Ronke and Felicia. 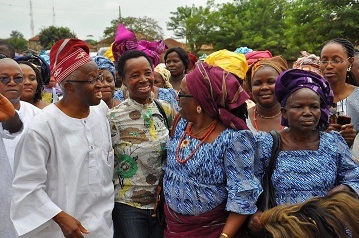 Behind Ronke & Felicia is Idowu, Mama’s niece and extreme right is Opeyemi, Ladipo’s daughter. 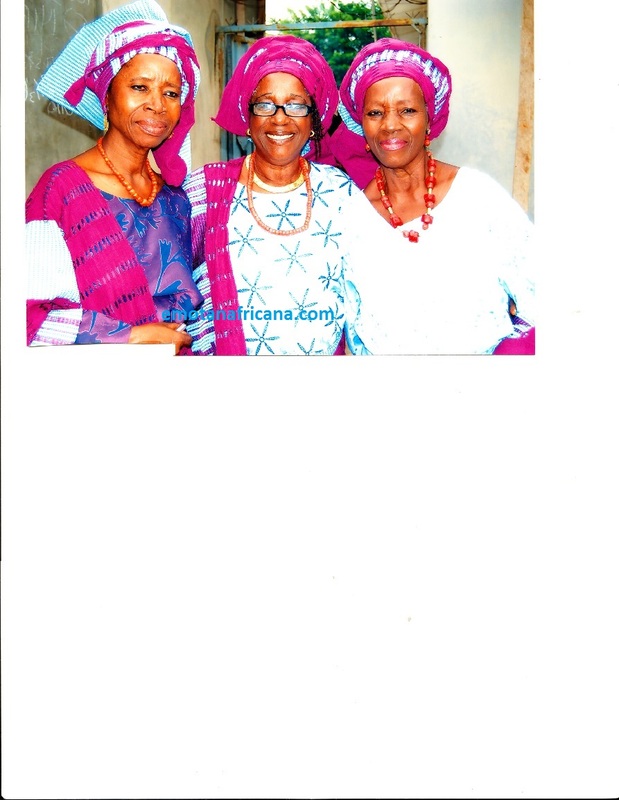 Mama’s only surviving sibling, Auntie Seyin, greets Mama’s daughters-in-law, Jumoke (Ladipo) and Bisi (Wole). 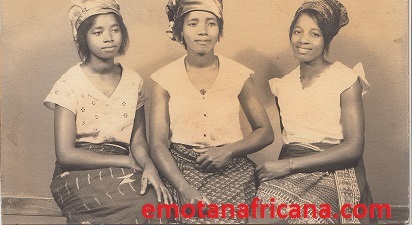 Looking on from right are Folaju and Selina, Mama’s nieces. 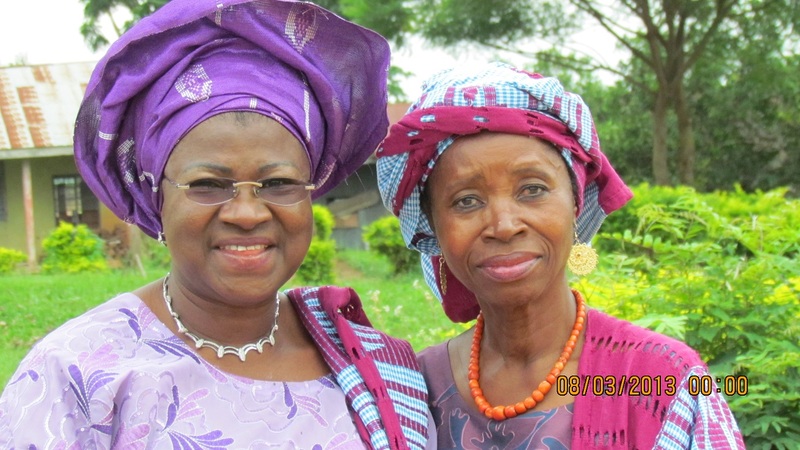 Bisi and Jumoke, Mama’s daughters-in-law rock Saro-style (S/Leone) long dresses! 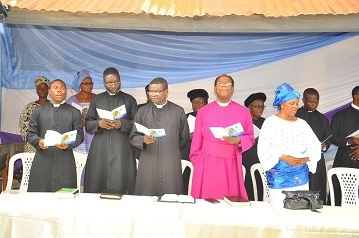 His Grace, Iju-born Dr. Samuel Adedayo Abe, retired Bishop of Ekiti & Archbishop of the Province of Ondo (Anglican Communion) & Mama Janet Abe friend and classmate of Ronke, at the Wake Service at the family home. 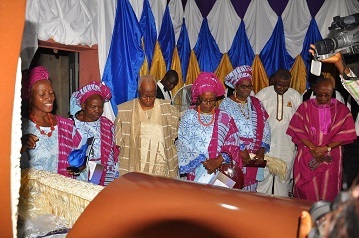 2nd & 3rd from right: Professor Akin L. Mabogunje & wife, retired Justice Titi Mabogunje, at the Wake Service. Emi, Mama’s nephew, (in white agbada) doing his thing. Testified – a fact known to most family members – that Mama saved him from himself after making him join the church choir after everything else had failed, and everything started falling in place – AT PRIMARY SCHOOL LEVEL! 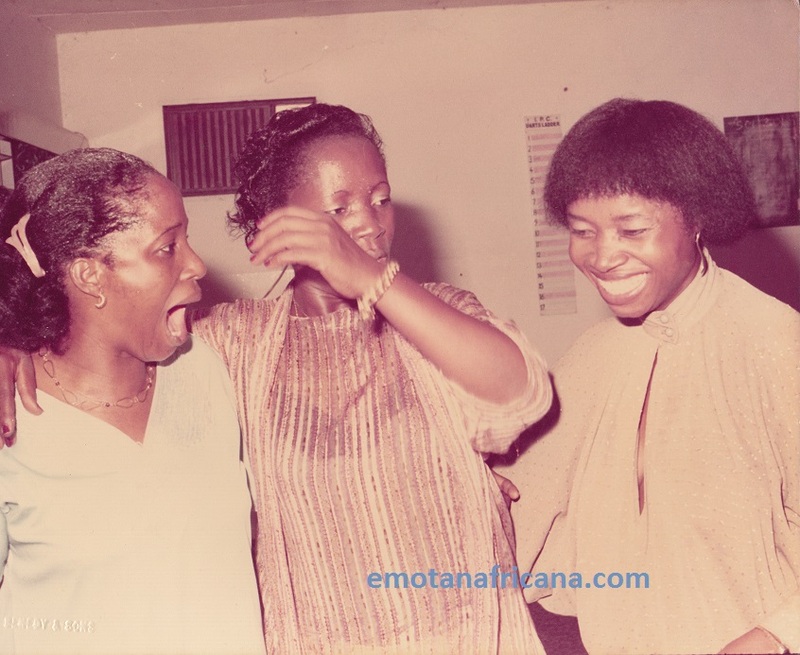 Kemi, an Adamolekun grandchild and a university research fellow, dances on the left. 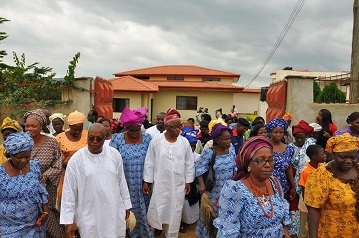 Children, spouses, grandchildren and others, L to R: Bisi, Tomi, Felicia, Ronke, Ladipo, Jumoke, Folaju (niece), Wole and Wolemi make a brief stop at Mama’s flat in the family compound. 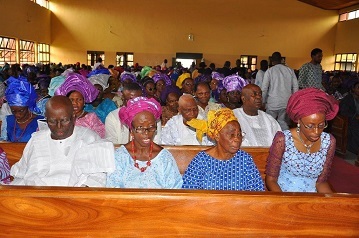 At the Christian Wake are L to R: two of the children, Felicia and Wole & Bisi, Wole’s wife; Mrs. Adeniran, Professor Tunde Adeniran, Ladipo’s long-time friend who was more like a child to Mama. 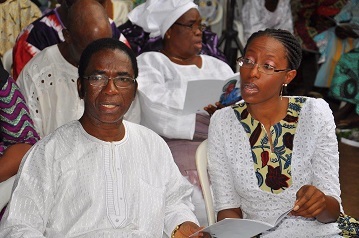 Next to him is Ladipo’s daughter, Opeyemi. 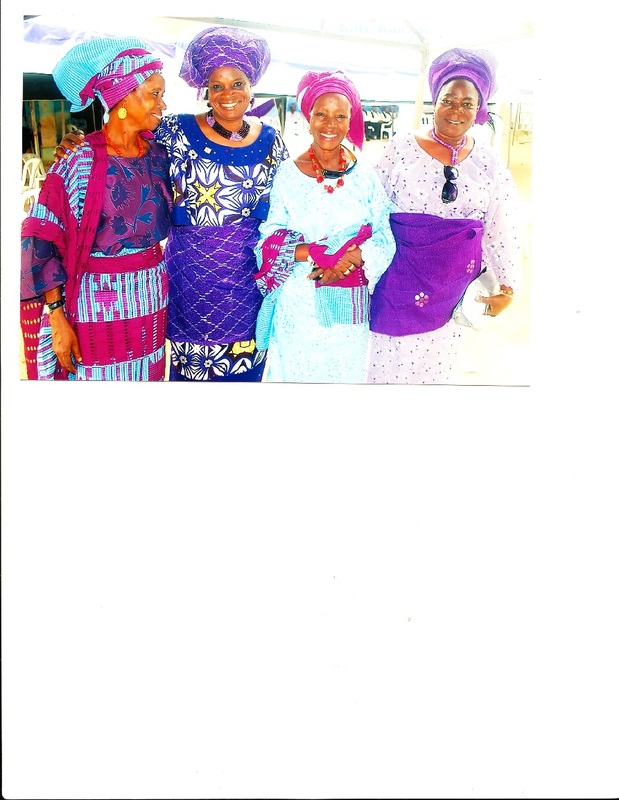 At Christian Wake, Blogger, Ronke, Erelu Bisi Fayemi, Ekiti’s First Lady and Ladipo. 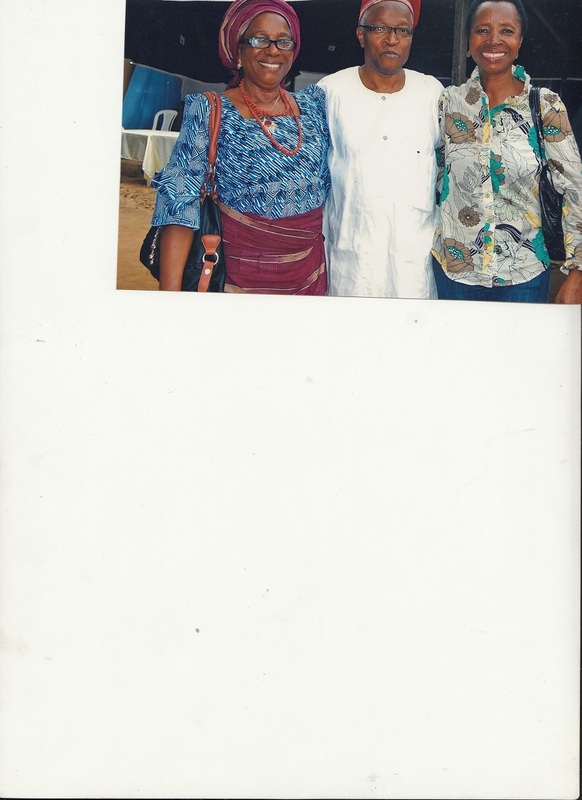 Behind Blogger & Ronke is Soji Ajakaiye, an Adamolekun grand-daughter. 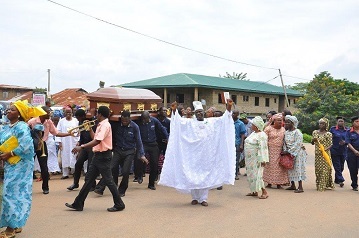 Ayo Adubifa offers prayers at Mama’s lying-in-state before departure for Church. 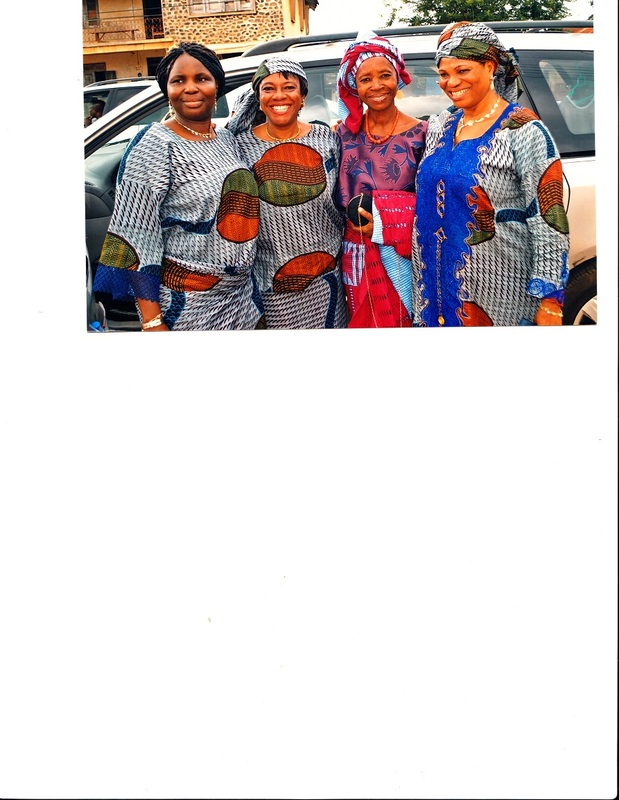 L to R: Felicia, Ladipo,Ronke, Jumoke and Wole. 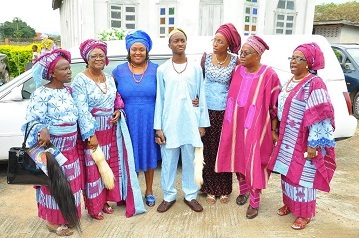 Between Jumoke and Wole is Bambo Olugbemigun (Ronke’s son). 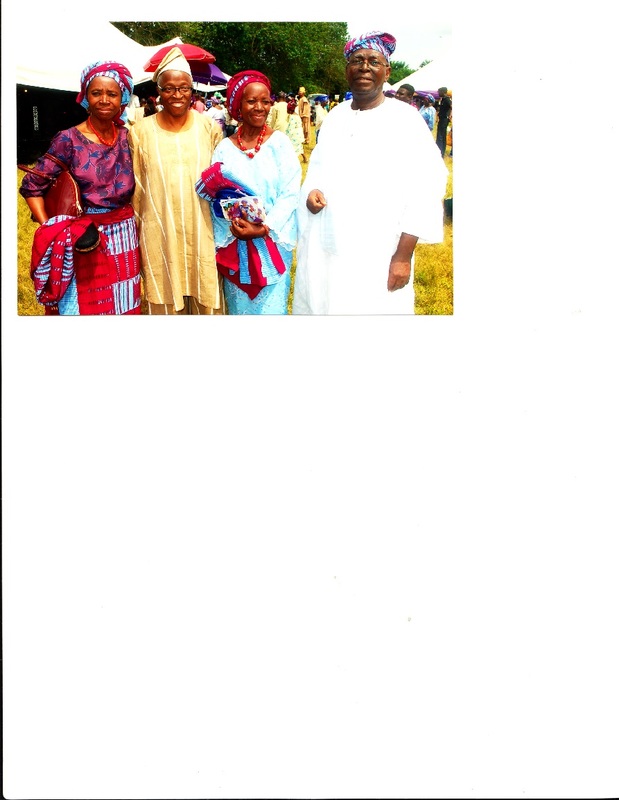 Dancing to Church, (in Reds), L to R: Wole, Ayodeji,Blogger, Jumoke, Bose (in Western dress), and Fehintola, an Adamolekun grandchild’s spouse. 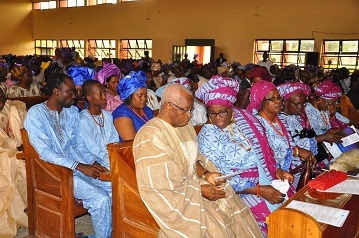 Some family members, L to R: Depo Adenle, (blogger’s spouse), Ayodeji, Sister Abi Araromi & Opeyemi; Between Ayo & Sister Abi at back, Dr. Joseph Adamolekun, and to the left, Mrs. Fajana (Ronke’s sister-in-law from Ise-Ekiti). 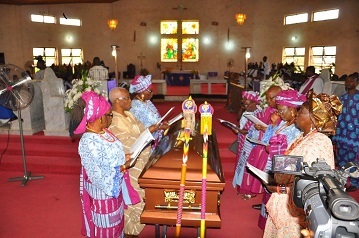 Behind Dr. Adamolekun is the oldest surviving child of Late Papa J.F. 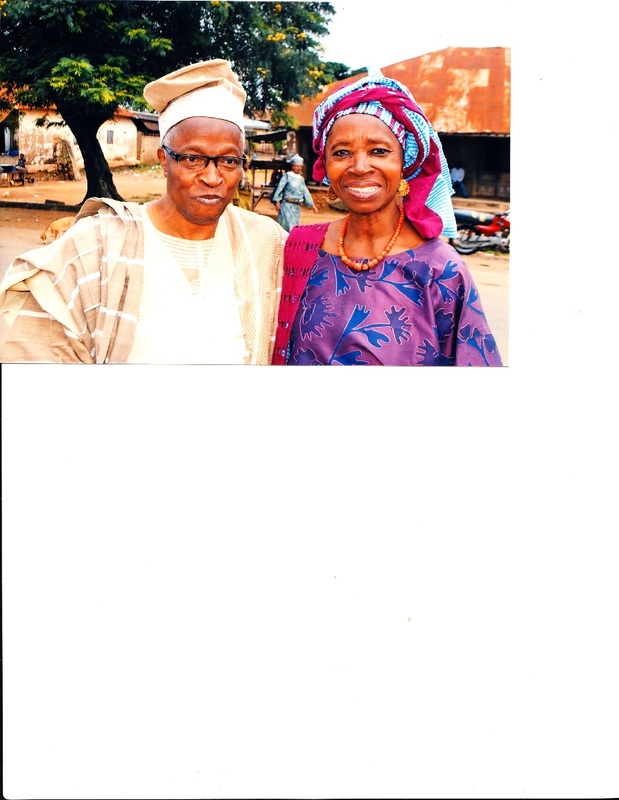 Adamolekun, Octogenarian, Barrister I.O. Adamolekun. 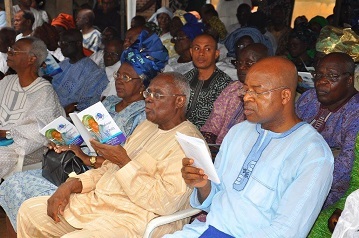 Behind Opeyemi is Tobi’s guest, Sir Tayo Ogunsanya, his father-in-law. 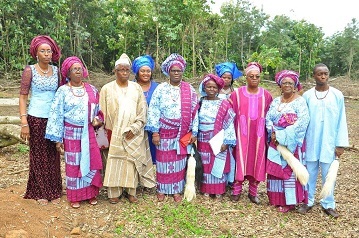 In purple, Theo Ladi Abioye (“Ladi Pupa”; Ladipo was “Ladi Dudu”), Papa J.F.’s nephew from Ise-Ekiti; lived in family home at Iju and attended school up to Standard VI at United School, Iju/Ita-Ogbolu which later became Iju/Ita-Ogbolu Grammar School in the 50s; pictured with wife, at the church service. Ladipo makes announcements at the end of the service. 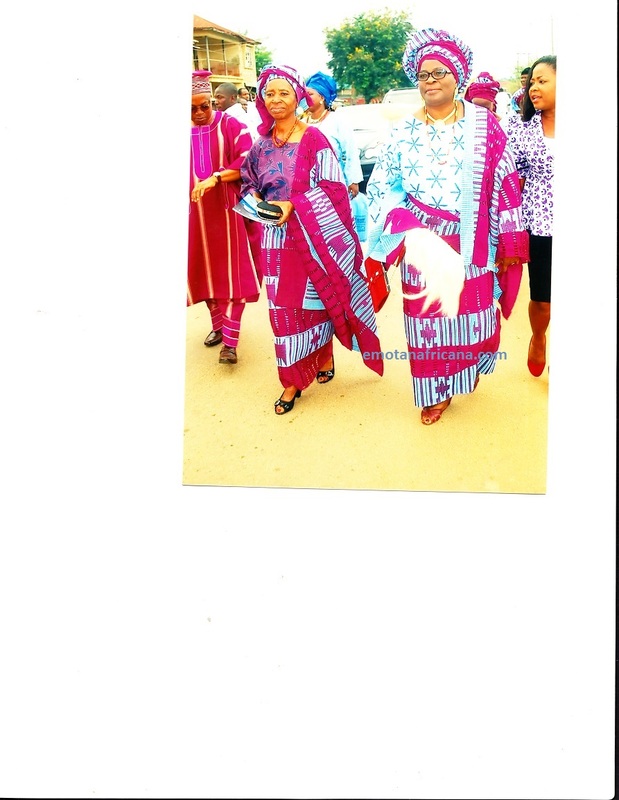 His choice of SANYAN Aso Oke is the right thing to wear at such an occasion as readers of this blog have been told over and over again in the section on “Yoruba History & Culture”. 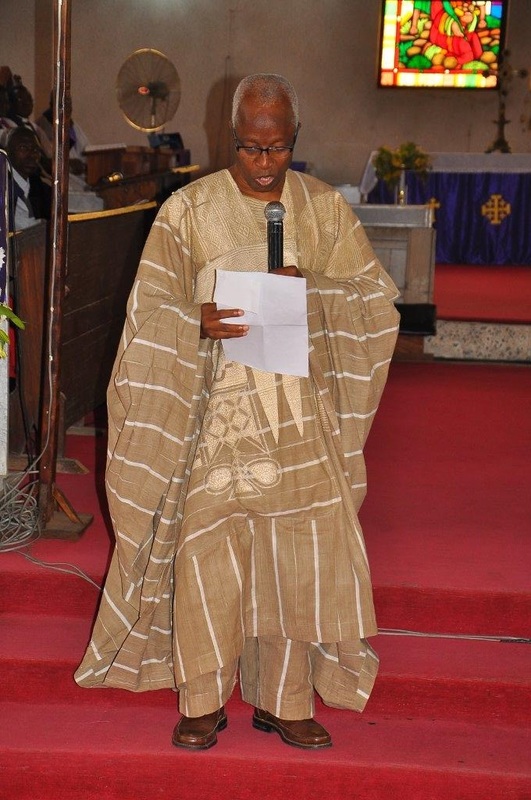 It is the most appropriate Yoruba cloth for weddings, graduation ceremonies (by fathers, especially) funerals of parents, and other big formal occasions. 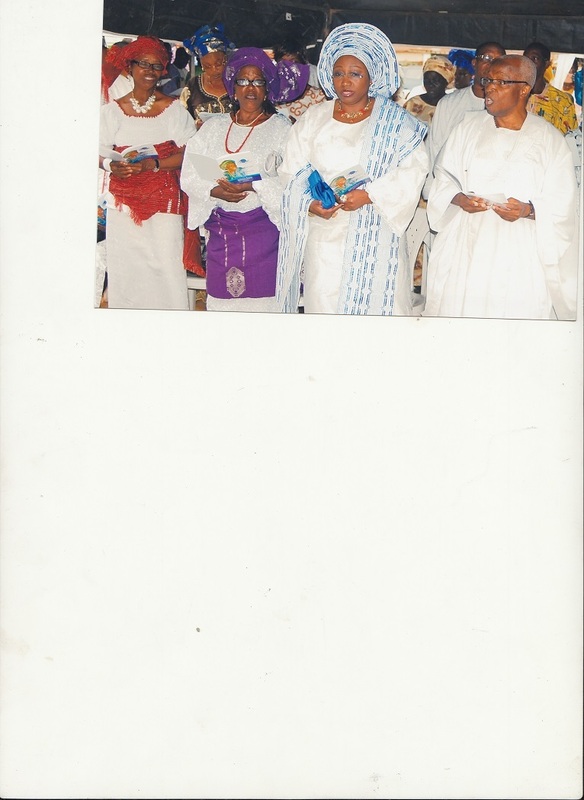 It is the first of the three great Yoruba classic aso oke: Sanyan, Etu & Alaari. 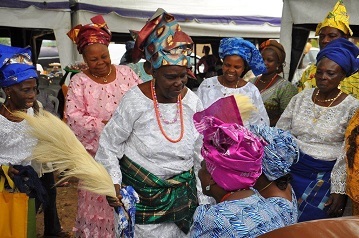 Sanyan is called olori aso or oba aso – King of clothes, and are generally passed down the male lines of Yoruba families, hence Late Beier’s appropriate English description, “cloth wears to shreds”. Ladies in synthetic thread Igba lo de – fads – though bold and beautiful, eat your hearts out! 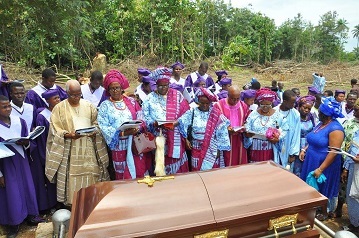 Mama’s children, some grandchildren and spouses at the burial ground. Behind them to the right is Esther, Mama’s Caregiver who was like a daughter to their mom. 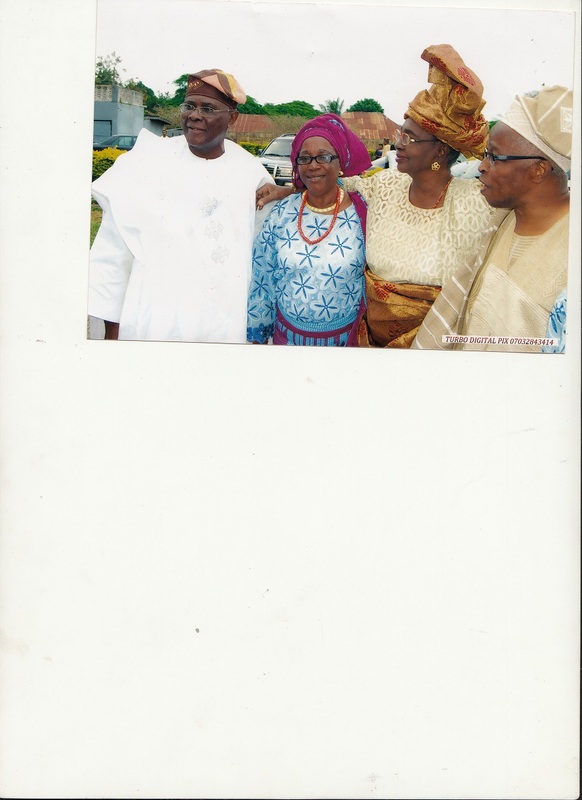 Above two photographs, Pix 1: Kabiyesi Oba Adebamigbe Olugbemigun, Olujare of Ijare, Olori Ronke Olugbemigun & Prince Adebambo Olugbemigun at the Reception at Iju-Itaogbolu Grammar School, the old United Senior Primary School of the early 1950s where Ladipo had his senior elementary education with pupils from Iju and Itaogbolu twin-towns. 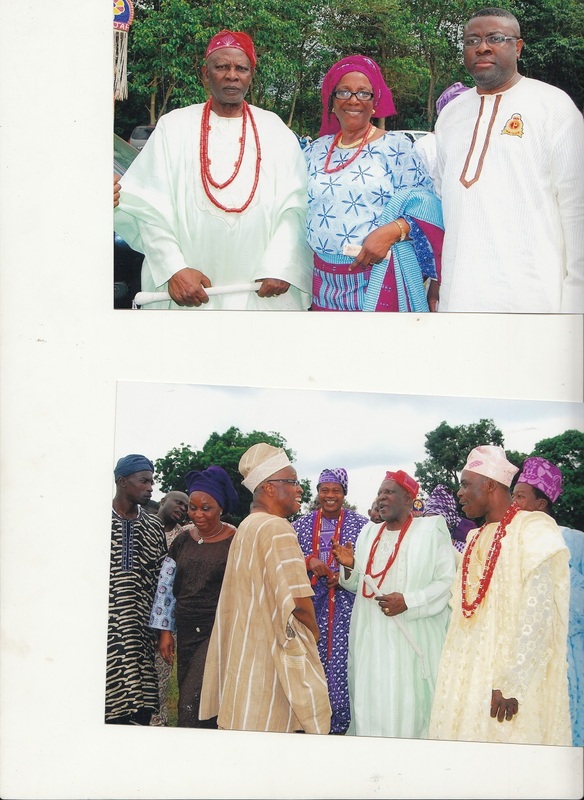 Pix 2, Oba Olugbemigun and his chiefs share a moment with Ladipo at the Reception. 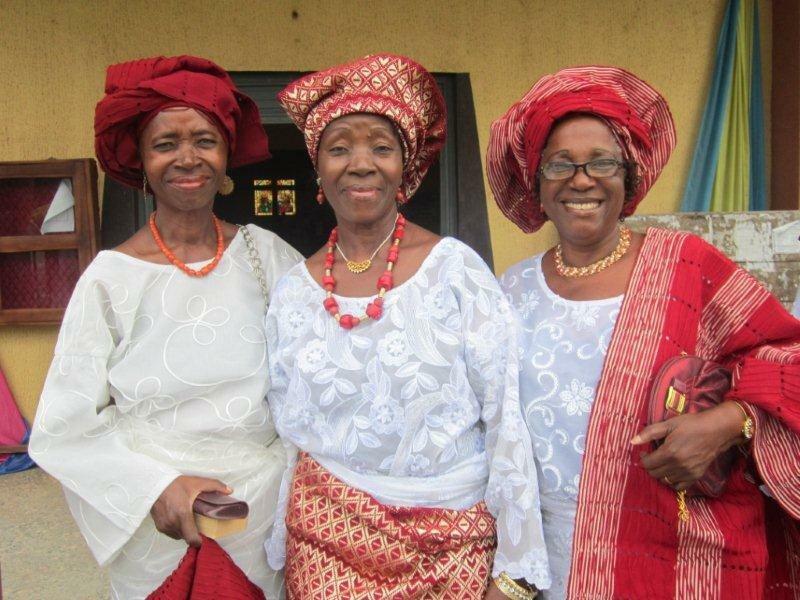 Yoruba Aso Oke for the ladies is an Ile ‘Luji [Ondo] modern take of the old omolangidi weave done in red Alaari color. And this, perhaps, is as good a time as there could ever be to take blog readers down memory lane for a bit of sharing as regards above three Iju Ladies! Celebrations on the 25th Anniversary of the Translation of Papa J.F. Adamolekun. October 2012. And a little further back, 49 years ago – to be precise, warts and all! Now we feel as though we WERE there. Now, how in the world did you come about that “… could not be posted”??? Just did, anyway! It was a blast; was home for a whole week; hadn’t in five decades! I think the incredible energy and inspiration came from the experience. I’m sure she’s home now with the Others in the bosom of whom they all served. Thanks a million, and well done for this ‘irohin ko to a foju ba’ – This is not really like being there! It’s a well-selected collection which captures all aspects of the ceremonies. The speed by which it came out is also commended. E se – Thanks – for giving those who couldn’t ‘f’oju ba’ – see with their eyes; be there – the whole gist. Awa naa a dagba a darugbo o, ojo ale gbogbo wa adara loruko Jesu. – May we also be blessed with long lives. Many thanks. It was such a pleasure seeing everybody make the trip to give the last Mama a befitting farewell. The pleasure of being the “narrator” – is very much mine! Thanks for sharing these moments with us. May her soul continue to rest in perfect . May the Lord continue to grant us all good health and long life. May her soul rest in peace. 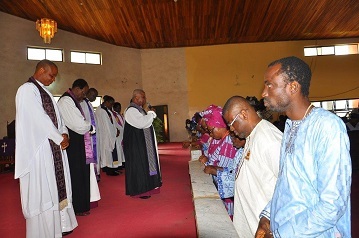 If the dead could see, She would be much impressed by the performance of the ‘crowd’ she left behind and the Anglican Province of Ondo. This is evidence of a well-spent life on earth and pointer to a heaven waiting to receive her soul and spirit. May the peace and blessings of God be with those left behind. Amen. E ma se gan! We all say a big “Amen” to all the prayers and good wishes. And may you not depart before those here before you. E ku aseyin de Iya agba. Eyin won o ni baje. Ojo gbogbo wa a d’ale. A o ri Omo rere s’ike ati gbe yin wa, o. Thanks for your prayers for the repose of Mama’s soul and for those she left behind, and that we all grow into old age with great kids to indulge us and be our remainder people! I hope my translation reflects your thoughts. 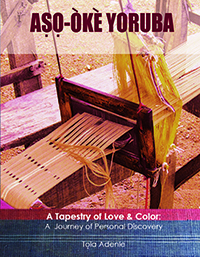 Thanks, again, for waking me up and getting me to get that useful information on Yoruba’s Sericulture past from her before it would have been regrets galore. Thank you so much for the lovely pictures. How nice to see the faces of uncles, aunties, cousins and other family members again. May mama’s soul rest in peace. A million thanks. Hope you are taking care of the two of you. Thank you very much for updating us with these memorable pictures. May grandma’s soul continue to rest in peace. 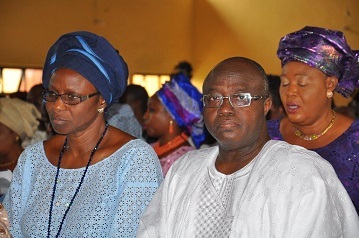 Its so nice to see aunty Wale Ojomo, Opeyemi Adamolekun and uncle Ladi’s (Prof) faces….. Its been such a long time. I really wish an Adamolekun Clan special reunion can be organised, that will be really great and a lovely opportunity to catch up with cousins, aunties and uncles. 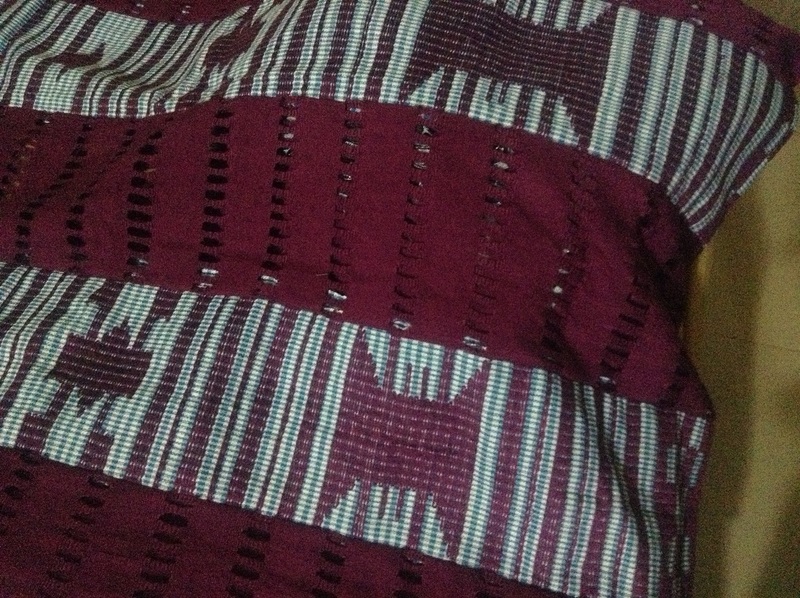 Once again, thanks aunty for this great work, God bless you. Wow … This is really great, Ma; it captures all aspects of the event, and I’m sure those who were not around feel just like they were present! E se gan-an ni , Ma. Thanks for this and a million thanks to everybody who made it possible. Most of the pleasure of putting it together and seeing the result and, of course getting feed backs, is mine.